The single-particle states of charge carriers in the nanospherical InP/InAs/InP heterostructure are theoretically considered in the isotropic effective mass approximation and in the regime of strong size quantization. The results of numerical computations of the energy levels of charge carriers at various thicknesses of the quantizing of the InAs layer of the indicated heterophase structure are presented. It is shown that it is possible to achieve the desired value and position of the size quantization levels of charge carriers in the layer by an appropriate choice of the layer thickness. The interband optical transitions in the InAs layer are also considered. The values of the effective broadening of the band gap of the InAs layer as a function of the layer thickness are computed. By numerical computations, it is shown that the absorption has a resonant character and that the diagonal transitions dominate in the spectrum of the interband absorption. For several diagonal transitions involving both light and heavy holes, the values of threshold frequencies and absorption curves are given. In the spherical InP/InAs/InP nanoheterostructure, the photoluminescence spectra were also constructed for various temperatures close to room temperature. Russian Text © V.A. Harutyunyan, M.A. Mkrtchyan, E.M. Kazaryan, D.B. 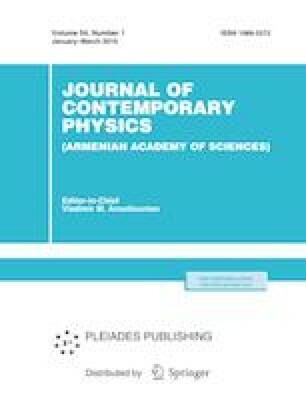 Hayrapetyan, 2019, published in Izvestiya Natsional'noi Akademii Nauk Armenii, Fizika, 2019, Vol. 54, No. 1, pp. 44–60.